You have done the most important thing which is finding the Miss Right, now you have embarked on the second most important task which is proposing with The Ring, which is to last a lifetime. Picking an engagement ring can be rather confusing. Which metal – Most commonly engagement rings are in 18ct White Gold or 18ct Yellow Gold. You can choose the metal based on the colour you like. We can also fuse both metals to give you a unique ring in two colours. Ring Design – There are various types of design settings. Bespoke designs are very popular and if you want to be totally original don’t be afraid to get designing and make your vision come to life, we can assist you with this. Traditional engagement rings are diamond rings however precious and semi precious stones embedded in the engagement ring is becoming more popular now. You will be able to select from 9ct, 14ct to 18ct Gold and Sterling Silver. Gold is a precious metal and its purity is measured in Carats, with 24ct being the purest. Jewellery is rarely made in 24ct Gold as this form is too soft for daily wear. Copper and Silver are mixed with pure Gold to make an alloy which is strong enough to make Jewellery. Example: 18ct Gold is 75% pure gold and 25% mixture usually Silver and Copper. White Gold is also a mixture of pure Gold and a white metal which is usually Palladium to give it the white colour. White Gold is plated with Rhodium to give it a long lasting lustre. Silver is another precious metal and jewellery is made out of Sterling Silver which is 92.5% pure Silver. Do I need to make an appointment or can I just pop into your shop? We work by appointment only, just fill a form on the contact us page or any product page. How can I change the date/time of my appointment? Just email us and we will change this for you. All we ask as a matter of courtesy is reasonable notice. How quickly will our rings be ready? Normally wedding rings are ready for a fitting in approximately 6 weeks from date of order. If the rings are required quicker than this just let us know. When can I select my bridal jewellery? You can select and take away your bridal jewellery at the time you place your wedding rings order (subject to availability), alternatively the jewellery can be collected at the same time as the wedding rings. We are not getting married until next year or the year after, do we have to pay for the rings immediately? No you do not. All we ask is you pay a 25% of the order an affordable deposit at the time of order, by credit/debit card, cash or mpesa. The balance can be spread over to your preferred collection date before your wedding. 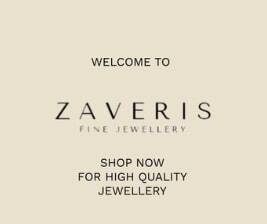 At my one to one wedding ring appointment, am I under any obligation to buy rings from Zaveris? No you are not under any obligation whatsoever. Come and enjoy a relaxing coffee. If I choose to order at a later date will the price be the same? Probably not. Precious metals and diamonds seem to continue to rise in price. If you want to secure the price offered at your one to one appointment it is best to place a deposit at that time, which secures the price and then choose our flexible payment plans. Many couples are now choosing this option to remove the risk of paying more for their rings at a later date. My wedding ring needs re-polishing, is there a charge for this? We will re-polish free of charge your wedding rings once a year for a period of 3 years from the date of purchase, we only charge for plating if that is required. What happens if we damage our rings by accident? If you damage your ring accidentally we will offer you our bespoke repair service. If my finger size has changed by the time we get married can it be changed? That’s fine, we will re-size free of charge. I need a shaped wedding band to fit my engagement ring, do you make these? We love to make these and have a special collection available, plus a fully bespoke service. What should I do if I have any more questions? Clarity, Cut, Colour, Carat are the basic terms you should get yourself familiarised with. Clarity – This has the most influence on the price of the diamond and is measured by grades which indicate the level of inclusion, blemishes, scratches, air pockets inside the diamond. Cut – This determines the sparkle of the diamond in order to reflect as much light as possible by adjusting angles and proportions. We always wonder how Pearls are made, it is Oysters that make Pearls. Chemically, Pearls consist of layers of calcium carbonate and animal tissue called nacre all bead into the body of the Oyster. A Natural Pearl is formed when a foreign particle, such as a grain of sand, invades the Oyster’s shell. The Oyster then defends itself by coating the irritant with a secretion of the same substance that makes up the inner layer or “mother of pearl” of its outer shell. This protective secretion builds up and hardens inlayers and over the span of several years a Pearl is born. However most Natural Pearls are simply quite rare and beyond most consumers means. This resulted in the formation of Cultured Pearl industry. The “Cultured Pearl” is clearly the most common and most affordable. Cultured Pearls are formed when an Oyster is deliberately injected with a foreign object to encourage the process along. Today, pearl makers take advantage of the Oyster’s defences by performing a delicate operation of sorts: The shell is pried open to insert a small piece into the body of the Oyster. Nature then takes its course and after three to six years its harvest time! Imitation Pearls and man made, they are no gemstones. They are simply made of ceramic, shell, glass or even plastic. These are simple man-made beads finished with a special solution to prevent discolouration, chipping and peeking. Imitation Pearls are marked under descriptive names such as artificial, man-made or faux. Sometimes regional names are used like Laguna Pearls, Red Sea Pearls and Majorca Pearls. These Pearl imitations normally look flawless as most man-made objects are in fact flawless but only Natural or Cultured Pearls can give you the true uniqueness that Pearls create. Jewellery is worn on a daily basis and should be looked after so as to preserve it and to enjoy it forever. Jewellery should be removed before taking a shower, manual tasks and during exposure to chemicals and fluids to prevent it from scratches and damage. Wear your jewellery after applying your makeup, since makeup, perfumes, hair sprays and lotions all have chemicals which could damage your jewellery. Do not wear jewellery whilst swimming or in a Spa as chlorinated water can often damage the jewellery. Store your jewellery in a container to prevent pieces from moving around. Do not store pearls with other metal jewellery. Pearls are an organic gem and they require specific care that will protect them for a very long time. and hair care products of all kinds. Never use toothbrushes, scouring pads or any type of abrasive material to clean your Pearls. Never use any other commercial cleaning pad. Never clean your pearls with anything containing chlorine bleach, vinegar or ammonia (including windoline). of the Pearl to deteriorate. little moisture like your skin so that they will not dry out! Never store them in with your other metal jewellery. Always remember that your Pearls should be the LAST THING YOU PUT ON when dressing and the FIRST THING YOU TAKE OFF when you get home.